With stars such as Hu Ge, Yang Mi, Wallace Huo, Tang Yan and Liu ShiShi starring in Chinese Paladin TV Series, it will be the first series airing on Jiangsu Satellite TV 2010 New Year launch. On the 15th December 2009, producer of the series, Karen Tsoi; Hu Ge, Liu ShiShi as well as netizens were guests for an interview at Sina. Zhao Ning (Host): Welcome Sina netizens, I am the host Zhao Ning. From the preparation of the series to filming to airing, many fans have been following “Chinese Paladin 3” with great interest. We have also just received news that this series will be the first series to air on Jiangsu Satellite TV for 2010. Today, Sina Entertainment is very honoured that we were able to invite such guests here and have a chat with everyone. Welcome Hu Ge! Zhao Ning: An old friend of Sina, you have a very high number of sina twitter followers. Hu Ge: It’s just a place where I express my thoughts. Zhao Ning: Welcome Liu Shi Shi starring as Long Kui in the series! Liu Shi Shi: Hello everyone. Zhao Ning: At the same time, we must introduce a very important person. She is the producer, Karen Tsoi. Everyone calls you Tsoi Jie. Zhao Ning: We also call you that. Everyone is quite familiar with “Chinese Paladin 3” – due to a classic game becoming a television series. In the beginning how did you have the idea? How different is the series compared to the game? Karen: 5 years ago, a friend bought the copyright of “Chinese Paladin” but for 4 years we weren’t able to shoot it. We found countless partners but they all refused this case, it was extremely hard to film as there are a lot of action scenes. After that someone suggested if they wanted to find Tangren as they specially filmed this type of series. Therefore, they called me and due to the fact that I don’t play games, and it was quite a different subject matter. When I researched on the internet, I then realised how popular it was, and thought it was quite fun. Thus, I confirmed it with my friend. When “Chinese Paladin” aired it was quite good, and many people looked forward for us to continue filming – the second drama being “Chinese Paladin 3”. Zhao Ning: From “Chinese Paladin” to “Chinese Paladin 3”, many people followed with interest. You just mentioned that there were many producers who did not want to accept the job, as there was too many action scenes and were difficult to do. How did Tangren manage this, in order to achieve most of the effects present in the game? Karen: I think Tangren probably didn’t care about its survival. Zhao Ning: Was there confirmed difficulties in the process? Karen: We didn’t know how to be afraid, and this attempt was quite daring. However, at that time we didn’t think about it so much, simply thought that this subject was good so we did it. We did, while we resolved matters – many of the technology problems were quickly solved. After the experience we gained from filming “Chinese Paladin”, we created an animation company, which is able to assist Tangren in creating this type of drama. Zhao Ning: I really want to ask the actors; did you find it quite interesting when filming the series due to the fact that particular scenes required special effects added afterwards? Hu Ge: When I came to this group, I felt it was quite familiar. The background is created by many blue or green wallpaper, so we would frequently be talking and fighting on our own in air. In terms of fighting, Shi Shi is quite amazing, her action scenes are really good. Zhao Ning: It appears that when such a weak girl fights is quite amazing, you have learnt before? Zhao Ning: Then breaking into Hollywood after that would be really good. I heard that actors there will frequently film like that. Hu Ge: Following the development of technology to film will not only act well but requirements wil also change. All you will need is to take one photo and create a 3D effect from it – there is already a movie out there like that. Us actors need to be prepared, and think what we will do in the future. Zhao Ning: How will you invest? Hu Ge: I will buy a blue wallpaper scene. Zhao Ning: I thought you would’ve thought of a related company. Karen: Hu Ge’s dream is to become a director, and is already looking in that direction. Hu Ge: Start from posting sina tweets. Zhao Ning: There has been a big change of actors starring in “Chinese Paladin” to “Chinese Paladin 3”. Hu Ge is the male lead in “Chinese Paladin”, but why was he chosen to be so? Karen: He has a “Chinese Paladin” symbol – he looks like the spokesperson of “Chinese Paladin”. When we started to film “Chinese Paladin 3”, the company of the game did not have any requirements, just for Hu Ge to continue starring in the series. Zhao Ning: Did Hu Ge’s earnings increase from “Chinese Paladin” to “Chinese Paladin 3”? Zhao Ning: It is because your expenditure has increased, thus more is spent on the film. Hu Ge: My earnings has increased, but prices has so too. Karen: That’s a good thing for him – for “Chinese Paladn 3”, the production company is his management company. He said whatever he earned for “Chinese Paladin”, he can take advantage of three-times the amount now. However, he was a newcomer in “Chinese Paladin”, therefore his earnings were low. Hu Ge: Jing Tian is a happy character. Zhao Ning: When you were filming “Chinese Paladin”, Hu Ge was a newcomer, but you gained numerous fans who became to know you from that series. Has this amount of fans increased after 3 years? Hu Ge: I’ve aged. When we were filming “Chinese Paladin 3”, there was a scene where Li Xiao Yao travelled in time. He was considered a guide, giving Jing Tian advice in difficult times. There was a fellow worker in the company who was a fan of “Chinese Paladin” before he started working here and has also seen series. He was meant to attend, but was coincidently there when we filmed the scene where Li Xiao Yao was travelling in time. He ran over there because he wanted to see how Li Xiao Yao was in real life. Zhao Ning: A very big difference though. Hu Ge: The appearance is quite similar, but there will be a difference after a deeper understanding. And there is quite a few differences too. Zhao Ning: Care to explain? Hu Ge: Let me get a script (laughs). In simple terms; Li Xiao Yao has quite a big change, growing up in a small town and becoming a hero – therefore, there is growth. From beginning to end, Jing Tian maintains his happy-go-lucky behaviour. When faced with issues, he always uses a happy and a very relaxed method to solve them. After that, he brings happiness to other people. He places all his unhappiness in his heart, and uses his own ways to resolve them. Zhao Ning: I’ve seen many netizen’s discussions; Jing Tian is “the sky and earth is large but happiness is the largest”. Hu Ge: He’s a happy character. Liu Shi Shi: If Long Kui wasn’t so stubborn, she wouldn’t have waited a thousand years. Zhao Ning: Shi Shi took part in “Chinese Paladin 3” but did not in the first series. But you have seen “Chinese Paladin” yes? Liu Shi Shi: Some parts. At that time when I was studying, I did hear how popular “Chinese Paladin” was. Zhao Ning: When it was confirmed that you would be part of the cast of “Chinese Paladin 3”, what type of role were you looking forward to? How did you feel? Liu Shi Shi: At that time, it was already confirmed that I was going to play Long Kui. I have downloaded the game to play, but I wasn’t very good, so I did not end up finishing the game. Then, I went to search some netizens who really liked “Chinese Paladin, and saw some screen captures, so I looked at those. Zhao Ning: Long Kui is a wrongly accused spirit from a thousand years ago? Liu Shi Shi: Not a wrongly accused spirit. She is a thousand year old ghost. Zhao Ning: I have read a description about her, and it says that she is a thousand year old immortal, but only due to feelings. This character you have portrayed is quite old in terms of age. Liu Shi Shi: A thousand year old. Zhao Ning: Waiting for a thousand years, there must be a lot of emotions. Liu Shi Shi: Yes. She has always been waiting for Jing Tian, and so she waits for a thousand years. Zhao Ning: The relationship between you two is emotional love disputes? Liu Shi Shi: A very innocent and innocent relationship between a brother and sister. Zhao Ning: What kind of story is it when you have reincarnated and the one you see is Jing Tian? Liu Shi Shi: In her mind, she is absolutely sure that he is her brother, and no matter how much he has changed, he is the only one in her heart. Zhao Ning: A very stubborn girl. Liu Shi Shi: If she wasn’t, she couldn’t have waited for a thousand years. Zhao Ning: Was it a challenge playing a role like this? Liu Shi Shi: She has two faces, whenever she encounters any dangers, she will become red out of fury very publicly. When I first started, it seemed as if the red Long Kui was more of a challenge. However, when I began filming as the gentle blue Long Kui, the afraid-to-be-public side of the character was actually more of a challenge. Hu Ge: Liu Shi Shi is a blockbuster. Zhao Ning: It’s Hu Ge and Shi Shi’s first time working together? Liu Shi Shi: It’s the third time. Zhao Ning: You both have worked together a number of times, is there chemistry between you two? Hu Ge: Previously, we haven’t had much scenes together. Zhao Ning: Worked together the most in this series? Zhao Ning: What personality does Shi Shi have? Upon appearance, it seems as if she is very gentle and quiet. Is her acting ‘explosive’? Hu Ge: She is considered a blockbuster. Most of the time she is gentle and frail-looking. However, she is amazing when filming action scenes. You wouldn’t believe that she has become a female kungfu star. When we were filming “Chinese Paladin 3”, there was one scene which left the deepest impression on me – it was when my past life was with her, and we finally reunited after my years of battle. When she was speaking, she started to cry. She had tears from the beginning right till end, and they didn’t stop. Zhao Ning: She can cry easily. Hu Ge: I absolutely believe that she has totally become her character. Zhao Ning: Shi Shi recall this scene? Liu Shi Shi: I am a person who expresses my feelings while doing my lines. That scene mentions the fact that I have waited for him for so long, and when he finally returns, I could not hold down my feelings, and cried the whole time. Zhao Ning: What it also your most memorable scene? Liu Shi Shi: It was quite memorable. Zhao Ning: Is there any others? Were they action scenes? Liu Shi Shi: I have little action scenes, as the red Long Kui doesn’t come out too often. Though, once I do, it usually results to fighting. Zhao Ning: It is because of a background in dance, so it was much easier for Shi Shi to do fighting scenes. What about Hu Ge? Hu Ge: She has dance background, I have a background in turning upside down. Zhao Ning: You are not Xiao Shen Yang, why are you turning upside down? Hu Ge: When you begin to learn boxing, you must learn how to take a beating. It’s the same with acting. I’m not saying that you must take a beating, it’s in terms of when you’re acting, you need to know how to protect yourself. After all, there is a definite danger in action scenes. I believe that you must listen 100% to the martial arts teacher, and filming fighting scenes depends on the coordination of a number of people. You must first learn your sense of direction and distance well, then it will appear real onscreen, and safe for your own sake as well. Hu Ge: It’s all from turning upside down. Zhao Ning: Ok, I’ll ask the producer. There are many actors in “Chinese Paladin 3” who newly entered into this series from the last. Other than Shi Shi, there are also many excellent actors, comment on their performance and your thoughts on choosing them? Karen: We have thought about using the same cast from “Chinese Paladin”, but realised that was unrealistic. After “Chinese Paladin”, the stars earnings increased a lot. 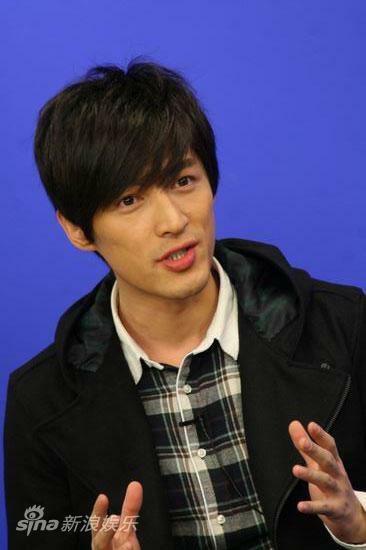 It was first decided that Hu Ge was to star in the series, and the other role which was extremely important was Chang Qing. He must be handsome, because he is Jing Tian’s idol – we then decided on Wallace Huo. Originally, time was a problem but I repeatedly requested him to take on the role, and it was quite an effort too. The series consisted of Hu Ge and Wallace Huo; the other important role, and Hong Kong actor Lin Zi Cong was most suitable for the role. These three male stars already accounted for majority of the budget. As for female stars, we needed to choose from new actors – someone who was young, beautiful. Among those stars, Tang Yan was outstanding, so she was the first one to be decided. Liu Shi Shi is a well liked and cultivated actress within the company so she was also decided on early in the process. Xue Jian was the last to be decided. When we started filming, we were still deciding who be take on the role. Many people helped out, giving us idea on who should portray that role. Yang Mi’s popularity was very high, so I approached her. When she played the game, she was also a Xue Jian fan, so that’s when we asked her. At that time, she was still filming for “Dream Of The Red Chamber” and needed to cater for both sides. It even resulted for her to take a month off, so it was difficult for us to continue work. We couldn’t find anyone else more suitable for the role, and we decided it was going to be her. It also meant that Hu Ge would need to work more harder, and didn’t get the chance to sleep much. When she came back, we needed to catch up on her scenes, so they had to film scenes day and night. Hu Ge will always be the most cooperative one, and the one who sacrificed the most. Zhao Ning: Hu Ge is very professional, not just good-looking. I want to ask the producer; there is a break of 3 years between “Chinese Paladin” and “Chinese Paladin 3”, other than gaining a very good public praise, many people were looking forward to “Chinese Paladin 3” and with need of employing the advances of special affects, what are you thoughts on the production? Karen: We didn’t have much experience in “Chinese Paladin”, and this included action within the series. At that time, we learnt while filming, and after 3 years of working hard we managed to result in this type of series. When we were filming “Chinese Paladin 3”, we totally followed the design of action scenes within films. The crew managed how each group was to film, how to do it. Our animator acted as a guide – everyone who was wearing green was to do such and such move. We did very little of that in “Chinese Paladin”. Much of the work was added on after the filming. Our approach in how we created “Chinese Paladin 3” needed the cooperation from everyone. Zhao Ning: The final results have been shown? Karen: Our first scene to film for episode 1 was fighting in the sky, but everything used a green wallpaper to do it. We did not do that in “Chinese Paladin”, but this concept helped a lot. The production of “Chinese Paladin” is much more brilliant that “Chinese Paladin”. Zhao Ning: The girls who are able to take part in “Chinese Paladin” are very fortunate. Liu Shi Shi: Because there are handsome guys. Zhao Ning: Not only handsome guys, the fairy in the series are also very beautiful. Liu Shi Shi: When I had my costume and make-up done, I saw how my dress was held up and did not let go, it looked really good. Hu Ge: Filming “Chinese Paladin 3”, a lot of the times were most naughty. Zhao Ning: When filming series, there usually a need for a creative imagination. Before, you two have worked together in “Young Warriors”, “Legend Of The Condor Heroes” and “Chinese Paladin 3” – which are all very different works. This time, you are able to work with Hu Ge much more. He’s just talked about you, you talk about him? Liu Shi Shi: He’s an older brother. We weren’t familiar with each other as we didn’t have much scenes together. (Hu Ge laughs) So when filming “Chinese Paladin 3”, I slowly got to know him more. He constantly makes jokes at the scene, but he’s a very good persion – no matter what you say, he can always come up with a comeback. Zhao Ning: Is his personality like Li Xiao Yao or Jing Tian more? Hu Ge: They have evaluated me like that before. They think I was easiest to work with when I was filming “Legend Of The Condor Heroes” and hardest in “Chinese Paladin 3”. I’ve grown up in “The Myth”. Zhao Ning: Many people are influenced by their character. Hu Ge: Yes. If you let her speak, she might not be able to say it. Her contact with me is not a lot. In “Young Warriors”, she was completely involved with her love for Si Lang, and in “Legend Of The Condor Heroes”, she was also in the world of Yang Kang. There wasn’t a lot of episodes where we would be in the same scene. Liu Shi Shi: But you were very approachable then. Hu Ge: Very silly, very idiotic. Zhao Ning: Hu Ge isn’t the same as he was in “Chinese Paladin” a long time ago. Zhao Ning: I’m sure you’ve had many feelings of growth? Hu Ge: But there are still things that hasn’t changed. Hu Ge: These feelings are still alive. Zhao Ning: That’s a symbol of success. When someone is famous, their age seems to fall. Hu Ge: You’re praising me. Zhao Ning: You’ve filmed so many ancient dramas, and portrayed a number of heroes, how do you feel? Hu Ge: The feeling is great. When I was young, I knew that many guys had a world of their own. 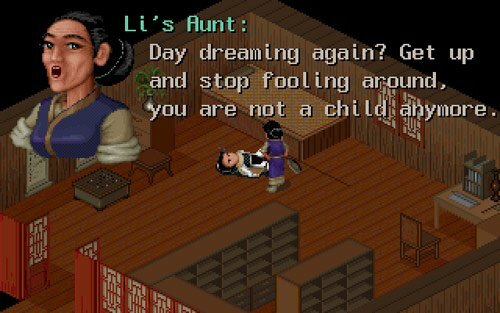 Not just a childhood world, but a mythical world, or a wuxia world. Mine was like that. My dad had a lot of books; like wuxia novels, so I would rummage through them. When I was young, I would also picture myself as a master of a wuxia world, or a hero. I was the type who fought against injustice and help fight for the weak and mistreated. I never thought that after becoming an actor that I would have the chance to act out my childhood role – the feeling was really good. Zhao Ning: I want to ask Hu Ge; when you were young, which wuxia hero did you want to be the most? Hu Ge: Ling Hu Chong. I didn’t say I must portray him, just simply of the characters within the wuxia novels, I like Li Hu Chong the most. Zhao Ning: You have recently been filming a modern drama. I don’t have a clear recollection of your modern dramas? Hu Ge: It’s hard to imagine, but I have been in 2 modern series before. Zhao Ning: How come I cannot remember? Hu Ge: One was before “Chinese Paladin”, it was very sentimental then. It was my second year at university, and I played a father of a 6 year old. It was quite a challenge for me, and was also my first modern drama. After that, I starred in “Till Death Do Us Apart” and the film, “Telephone 601”. Most people are more familiar with the ancient dramas I have filmed. Now I have such opportunity, I view it as a way to allow myself to see myself in both modern and ancient series. It’s quite good – when they asked me, they did also worry as I’ve mostly starred in ancient series, and didn’t know how it would feel to see me in a modern drama. Tangren will film “Sword Of Xuan Yuan” next year. Zhao Ning: Will you film the “Chinese Paladin” series again? Karen: Our next series is “Sword Of Xuan Yuan”, and is a similar game to “Chinese Paladin”. We will start filming next year in April. Zhao Ning: I have also played that game. Zhao Ning: There are many versions of “Sword Of Xuan Yuan”. Karen: We are filming “Rift Of The Sky”. Zhao Ning: I’ve played before. However, “Chinese Paladin” is the earliest game, so it terms of game fans, that’s the best game. Hu Ge: Which version is “Rift Of The Sky”? Zhao Ning: It’s quite fun. Will you be starring in it? Hu Ge: That’s for my boss to decide. Karen: It’ll be determined by his performance. Zhao Ning: Do you want to continue your career and make it to the big screen? Hu Ge: I think every actor’s dream and goal is to make it to be big screen. It’s when the audience will be spending money to see your film – the feeling will be quite different compared to a series shown on television. Zhao Ning: You will work even hard there? Zhao Ning: Because Shi Shi is a newcomer, the production company will give her opportunities in order to take part in such grand production series. What is your next job? Liu Shi Shi: I am currently filming “Clothing The World” in Hengdian. Karen: It is an ancient Chinese story about the legendary woman, Huang Dao Po innovating textile during the South Song period. It is a rather female dominated series. Zhao Ning: Your role in the series? Liu Shi Shi: A princess. Zhao Ning: It seems as if the 3 of your will be quite busy. Other than promoting “Chinese Paladin 3”, there are also some new works. Karen: Last night we arrived in Beijing, and we need to go back after this too. He [Hu Ge] needs to go back to Shanghai and continue working. We will be going to Hengdian. Zhao Ning: Still need to continue working? Zhao Ning: As Jiangsu Satellite TV New Year launch, many people will be looking forward to “Chinese Paladin 3”. Are we able to recommend this series? Zhao Ning: Hu Ge would say, ‘I star as Jing Tian and experienced so and so, everyone can see how to peform, etc etc’. Hu Ge: A hello to all Sina fans. Please support Sina’s twitter. Karen: A hello to all Sina fans. Next year’s opening series with be “Chinese Paladin 3” – it is a drama that we worked on for 3 years and prepared for 5 years. Hope everyone will be supporting it! Liu Shi Shi: Jiangsu Satellite TV will be airing our “Chinese Paladin 3” for new year, hope everyone will be watching it, it really is a good series. Hu Ge: Hello everyone, I’m Hu Ge. In the Year of the Tiger, you must watch “Chinese Paladin 3”. “Chinese Paladin 3” will be airing on Jiangsu Satellite TV. Hope everyone will support us, support “Chinese Paladin 3” and support Jiangsu Satellite TV; thank you. OMG! Guys, someone has STOLEN everything from my original Chinese Paladin website: https://t.co/xaUfaPz73K. https://t.co/bmdjdCcgir IS A FAKE WEBSITE. DO NOT SUPPORT IT.